On my second night at the camp ground near Novi Sad, I was the only person there and it was in a forest area with few people in the area. A rowdy group set up camp just next to the camping ground and began burning tree branches. In the middle of the night I was woken by someone rummaging through a plastic bag near my tent. I got up and shone my torch around, but couldn't see anyone. In the morning, I found the rubbish bag near my tent torn open. I guess it was just a rat ripping into the rubbish I had discarded. The sound is definitely amplified when you're in a tent and alone. My ride started with a serious climb, similar to the motorway near Dunedin, in NZ. It was a busy stretch of road too, so I didn't enjoy it. After a little way, the cycle route turned off the main road and I found myself on quiet country roads past vineyards. That part was most pleasant. As I approached Belgrade, the traffic got really scary. The road was the main route through south east Europe and there were constant heavy trucks whistling right past me. Apparently, the official cycle guide to the area says to avoid cycling there. The camping ground was on the near side of Belgrade, which was a relief. I turned off the main road too early for it and found myself at a military base. The guard was not thrilled to see me, although he did give me directions to the camp. The camp was the first one where I encountered a range of cyclists. The first evening, I spoke with a young German and the next day I spent some time speaking with a young Dutch guy spending 1.5 years cycling to Australia via India and Pakistan. A French couple also stayed the second night. The German cyclist was going to explore the city, but decided to use the reduced Sunday traffic to get away. The French guy stated that he didn't think the traffic was bad, although he admitted being hit by the bus the day before. Overall, we were all pretty traumatised. The verge of the road was crumbling, so there was no way to get out of the traffic flow without risking riding into a pothole and falling. A custom German hotel bus also appeared at the camp. I ventured into the city, but I was not impressed. 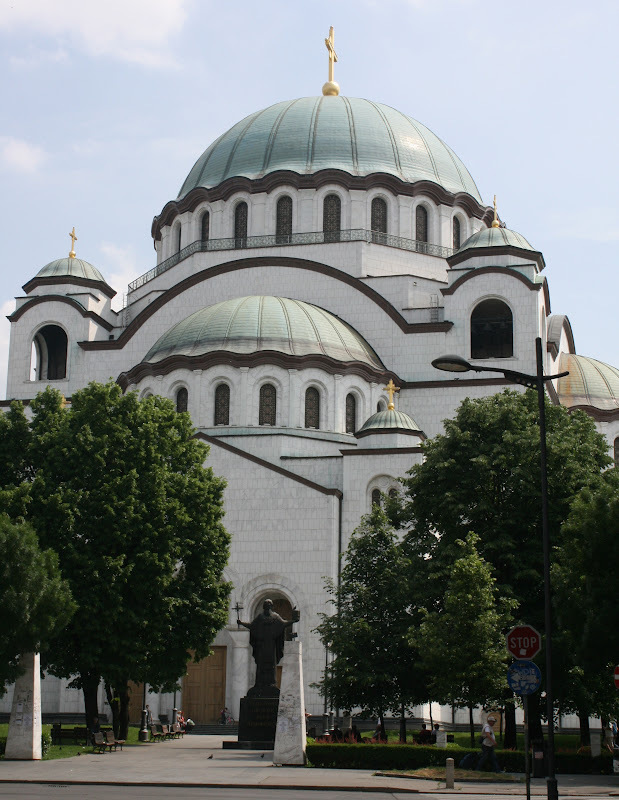 The main museum was closed for renovation and the second largest Serbian Orthodox church in the world was also gutted for repairs. I wandered around the fortress park area where vendors were selling t-shirts idolising Vladimir Putin. I went to a local shop for dinner ingredients both evenings, but the local produce that was available was pretty scruffy. I think I made a salad with a cabbage instead of a lettuce by mistake, and I made hotdogs to have with it. My cycle ride across Belgrade was ...interesting. It improved from the terrible main road near the camping ground and I followed off-road cycle paths to the centre city. There was even a cycle elevator from the main bridge down to the river bank. The Danube bike path is a major European route, but I lost the signs for it and took an uphill detour of some very busy city roads. Navigation was still near impossible because of the cyrillic alphabet on signs. I eventually found the Pančevački most bridge and crossed it, riding on the footpath. From there, the cycle path along the Danube quickly left the roads and I cycled along a dirt track in peace. I stayed in a camp near the Danube. There were no shops nearby, so the kind lady in charge gave me some food. Here's where the story peters out. The next morning, I got an email about work at my previous employer. It came at a point when I was lonely and I felt threatened by the Serbian traffic. 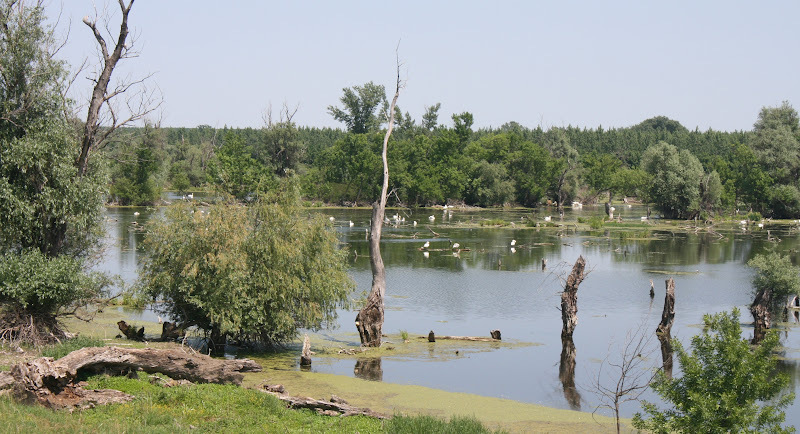 I cycled to a room at the next town - Smederevo - and a bunch of emails flew back and forth. I decided to try to get back to the UK, but the train to Belgrade wasn't an option. On the Wednesday, I cycled back to Belgrade as fast as I could. It was 38C, but I went really quickly because I knew I would need to get packing materials for my bike. I found a bike shop who gave me 2 small bike boxes. A Chinese market sold large spools of duct tape. I took an apartment for the night and spent hours dismantling and packing my bike. On Thursday, I found a taxi station wagon that carried me and the bike to Belgrade airport and I flew to Luton. I arrived late at night, rebuilt the bike, and cycled to a hotel. I went to a McDonalds for a late dinner. Everyone was speaking English - I almost cried with relief. The next morning, I followed a remarkably serene cycle path from Luton to Welwyn Garden City and then caught a train to Cambridge. I washed my travel clothes at a laundromat and then cycled to a friend's house to stay for a few days. It was all over as quickly as that.